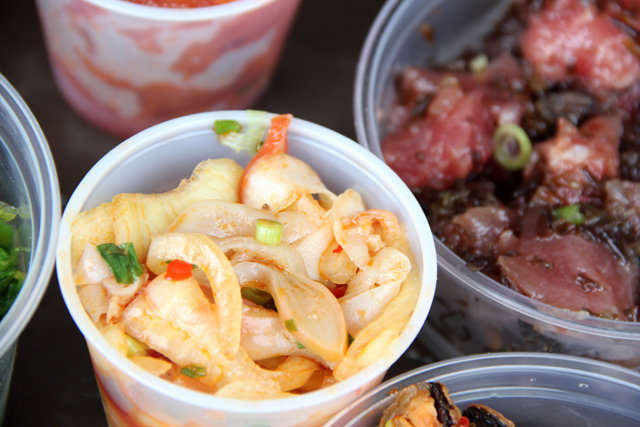 Honolulu, Hawaii is one of the greatest food cities in the world. While of course I’m a fanatic fan of the culinary wonders from Bangkok street food to Sri Lankan cuisine, Honolulu packs such a diverse collection of international (with an Asian focus) cuisine into such a dense little city on an island, making it tough to beat. 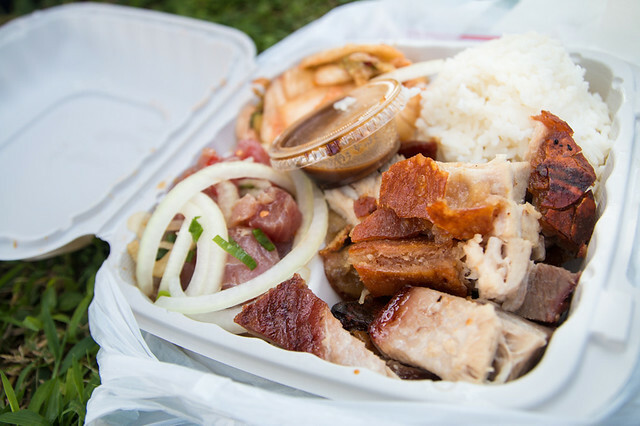 Still, it’s the local style Hawaiian take-out joints that everyone seeks in Hawaii – the comforts of things like poke (Hawaiian sashimi), SPAM musubi or monstrous plate lunches. I’m going to reveal to you a little Honolulu gourmet heaven located in the industrial Kalihi Kai area of Honolulu serving Hawaii food at its finest. 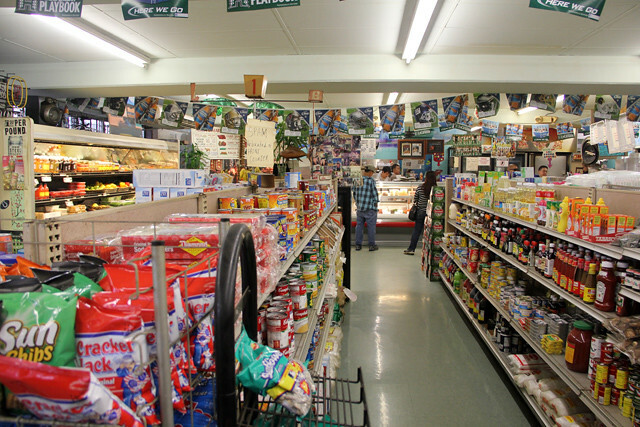 Alicia’s Market is a family run grocery store that has developed a famous reputation for its prepared food section. What looks like a normal vintage convenience store is really so much more. When you walk in the door you’ll be greeted by the friendly staff members or even the owner herself. 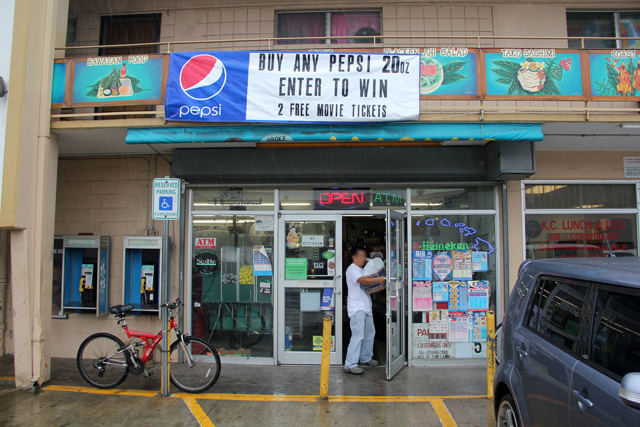 The register is stashed with local Hawaiian favorites like fried rice and Chinese sausage, a few kinds of musubi (rice balls), and a number of Hawaii Asian sweets. Alicia’s Market in Honolulu appears quite normal until you navigate your way through the canned goods and packaged snacks to reach the fresh food station. Then, things start looking really good! The immediate eye-catcher is the red illuminated roasted meat cabinet – a Hong Kong style glass enclosure stuffed with an impressive variety of artfully roasted meats. 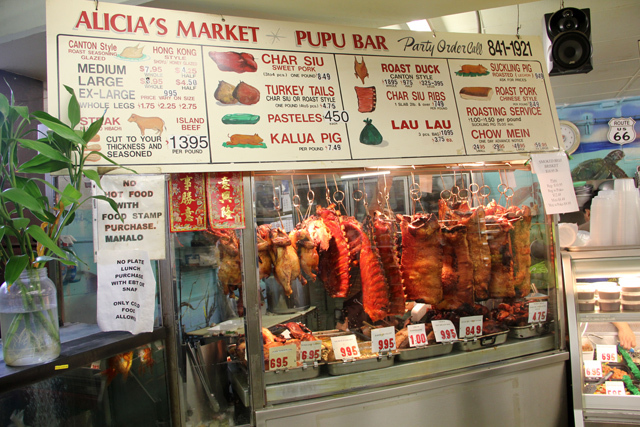 Since the owner of Alicia’s Market is originally Chinese, you can be assured they know what they’re doing when it comes to handling a pig in the kitchen. For the non pig eaters, there’s also turkey tails and roast chicken to choose. 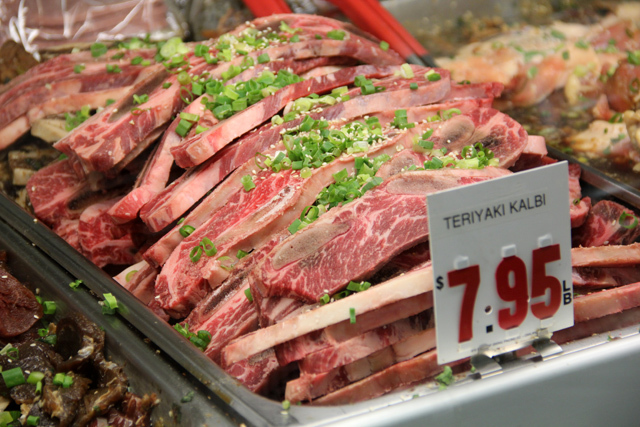 There are even a few items like the marinated Korean style kalbi that you can buy and take to self barbecue somewhere on the beach. But the roast meat station is not the only popular section of Alicia’s Market, the mega mish-mash of all things from the sea is what really made me drool and gasp with lust. 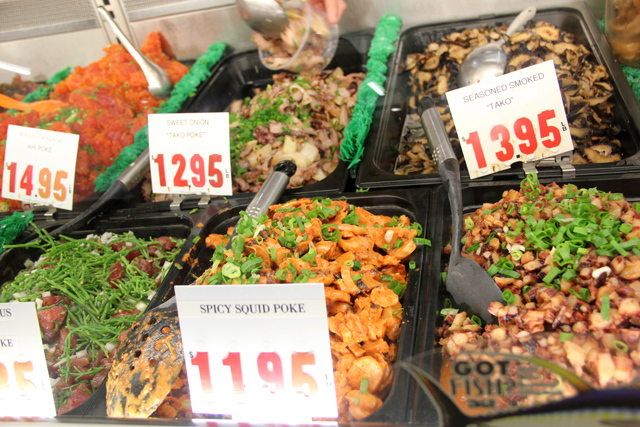 I got more than overjoyed when browsing the large selection of poke (raw fish salads) and other seafood dishes. Knowing we couldn’t buy everything I saw, it was a tough decision. They even have Puerto Rican pasteles on the menu! Pasteles are a traditional Puerto Rican delicacy that has found its way to Hawaii, and has even permeated into Chinese Hawaiian restaurants like Alicia’s. 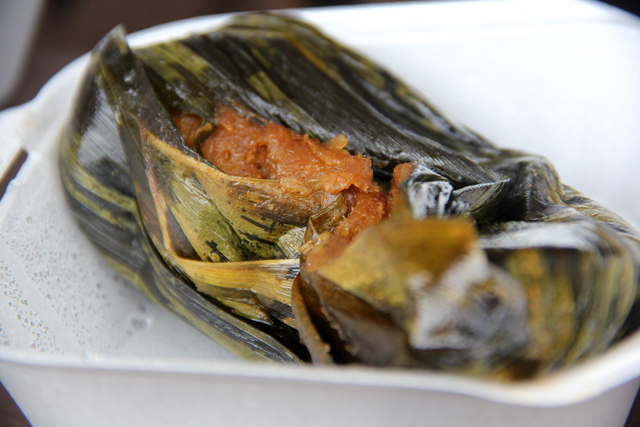 It’s made of mashed bananas filled with minced pork all wrapped in a banana leaf. It was superb, mouthwatering delicious along with some rice and hot sauce. 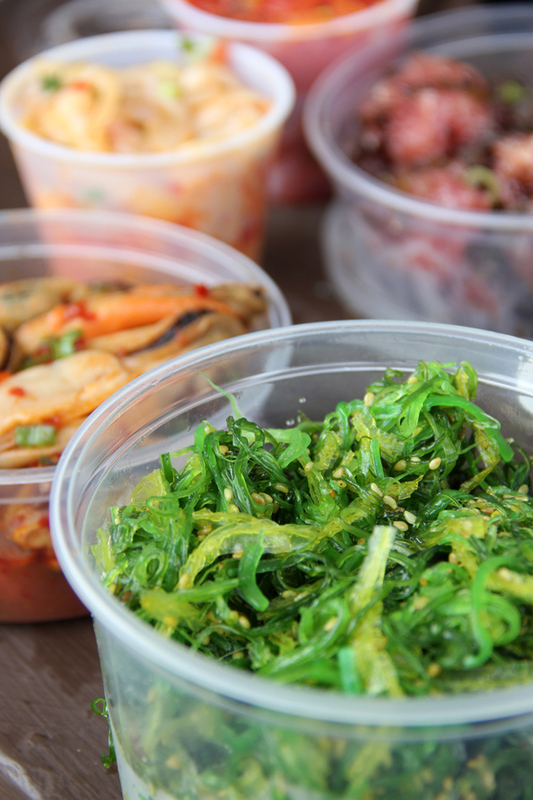 Ocean salad is a mix of sea plants dressed with sesame seeds. The saltiness from the salt water keeps the greens tasty and quite fishy. If you enjoy seafood you’ll probably love the ocean salad. I thought it was quite good, fresh and crisp. One of the surprising hits of this meal was the clam poke. 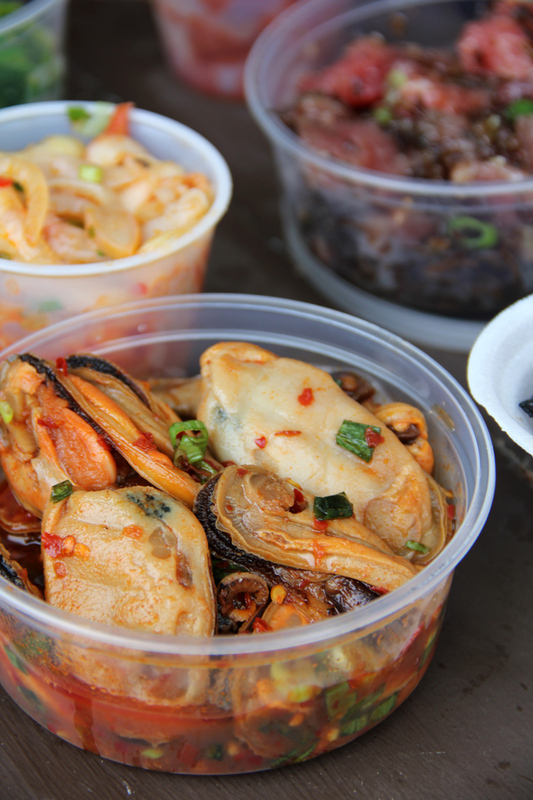 Slices of clam along with sweet onions were marinated in red oil so it was lightly spicy and massively flavorful. 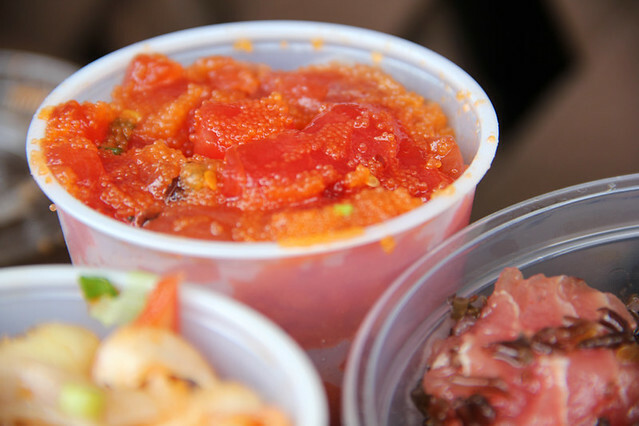 When it comes to Hawaii food, there’s not much I enjoy more than poke, Hawaiian style raw fish marinated in a number of different styles. When I noticed the wasabi masago ahi poke (Ahi tuna mixed with a hint of wasabi and flying fish roe), I had to have a taste. It was indeed everything I had hoped for – papaya tender chunks of ahi, lightly salty and flavored with wasabi and coated in fish eggs. 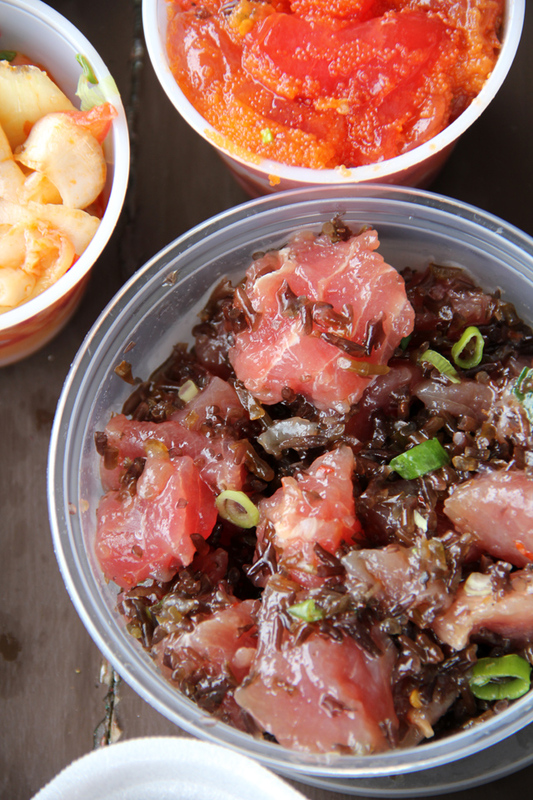 Two of the most traditional poke variations are the shoyu sweet onion poke (sweet onions and soy sauce sashimi) and the limu poke (mixed with some kind of seaweed). It was extremely fresh, high quality fish and the salty seaweed immensely complimented it. One of the absolute best things on the menu at Alicia’s Market is the mussel poke. First of all, the mussels were huge and they were bursting with a smoky taste and included a mild vinaigrette with green onions. The mussels were marvelous, I’d highly recommend them to all seafood lovers. The most amazing ribs in the world? Remember the glorious cabinet of meat at the beginning of this article? Well, there’s no leaving Alicia’s without a bit of take-out roasted meat. I could barely make it out the door before I had to have a sample of these beautiful glistening ribs. They were like pork candy, glazed and roasted in a sweet sauce until crunchy on the outside and juicy and moist throughout. The ribs fit in the criteria of culinary nirvana, any meat lover would surely shed a few tears with the sight and taste of these meat masterpieces. They next week I went back to Alicia’s to grab the takeaway Hawaiian food lunch special. 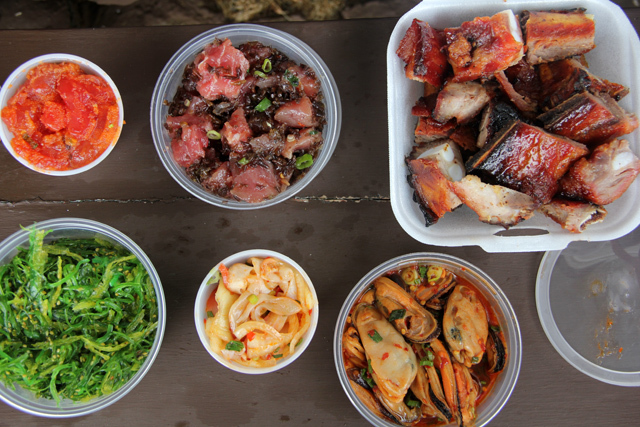 It was incredible, including a massive pile of kalua pig, huge laulau and freshly prepared lomi salmon. 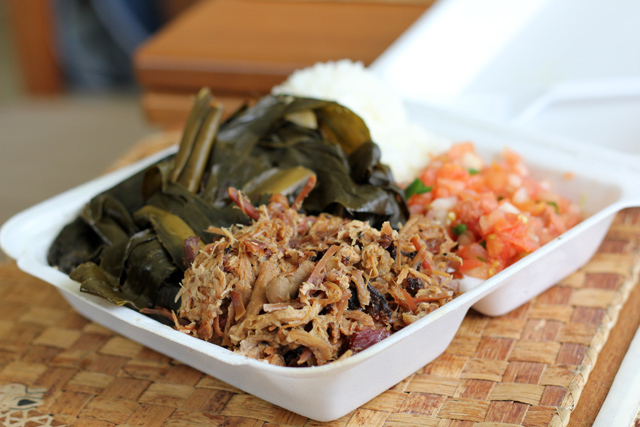 I have eaten at Alicia’s Market many times over the years, and on my most recent visit to Honolulu, I stopped by to get a plate lunch with roast pork and poke. It was my first time to eat Alicia’s roast pork, and it was unbelievably tasty. The fatty meat was so soft and tender, and the skin was so crunchy. If you love pork, you should go out of your way to eat the roast pork here. 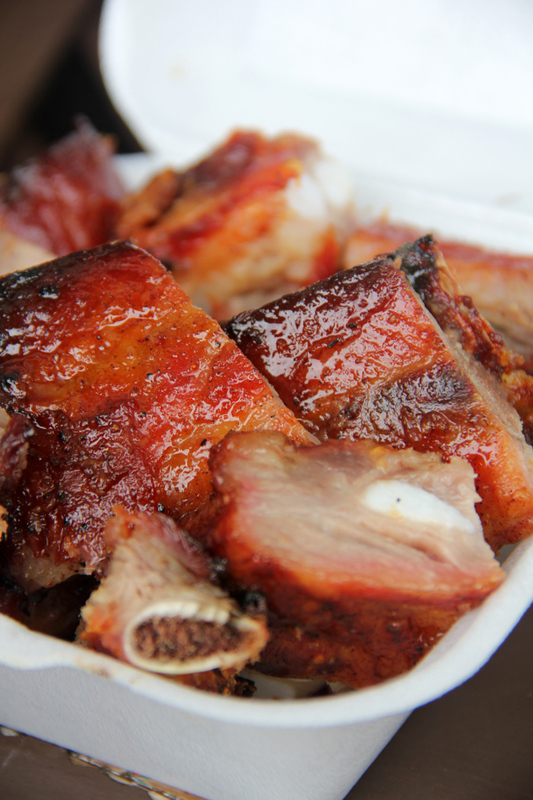 Prices: Most of the pokes were $12.95 per pound and the ribs were $7.95 per pound. More info about Alicia’s here. 18 comments. I'd love to hear from you! I’m going to be visiting Hawaii in June from Australia so I’ve started my research early! Looking forward to eating those ribs you talked about! Awesome to hear that Daniela, hope you have a great upcoming trip to Hawaii. As always, your photos are mouthwatering. This time the Puerto Rican pasteles caught my attention (of course). In the early 1900’s, skilled Puerto Rican laborers started to move to Hawaii to work in plantations. The two group of islands had similar crops. After a hurricaine detroyed the plantations in Puerto Rico, some people started to move to the Pacific Islands. Today, there are about 30,000 Puerto Rican in Hawaii. The pasteles are one of the most beloved Puerto Rican dishes (and one of the most difficult to prepare). Interesting to see how that particular dish stuck with Hawaiians. They are made of green bananas and a tuber called yautia (some people call it taro but it is not the taro popular in Hawaii which we call malanga). Sometimes a little bit of green plantains are added to the mix. The ones in the market you visited look so moist. I am suffering in here since I haven’t had pasteles in years. Hey Ruth, I’m so glad you shared all this information about Puerto Ricans in Hawaii. I didn’t know much about the history, I’ve just noticed and eaten a few of the foods that are in Hawaii such as pasteles – and they’ve kind of adapted them into the cuisine so they are eaten along with other Hawaiian foods – Hawaii really is such an interesting melting pot of cultures and cuisines! I hope you can find some good pasteles to eat soon! I was to Hawaii on a cruise in February. Of course, did not get to spend a lot of time. Would love to go back and just relax and explore. I will be sure to try some of this food. 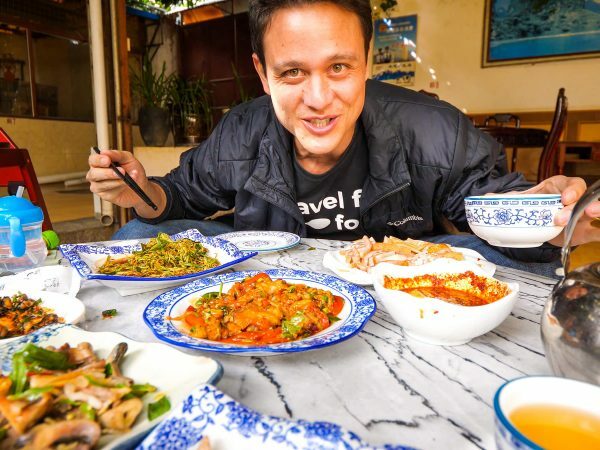 Cool to hear that Kathleen, hope you can re-visit Hawaii and try some of these dishes! As usual, it all looks amazing. The poke looks especially tasty – I can hardly wait to get back to Hawai’i and hope I have the chance to try some of these dishes soon! Hey Caanan, I’m with you and the poke, it’s one of my favorite single bites in the entire world. Hope you guys get back to Hawaii soon! My mouth waters looking at the photos! i grew up in Hawaii when I was younger and love all this food – especially the spam musubi and Poke! Great to hear that Caroline, did you grow up in Honolulu, or another city/island? We both have some culinary roots in Hawaii! I grew up in Mililani (I went to Mililani Uka Elementry School) :)… outside of Honolulu… you? Cool, my relatives are right in Honolulu, just off Ala Moana Blvd. Do you know Waiola Shave Ice (http://migrationology.com/2012/07/waiola-shave-ice-best/) – right around that neighborhood. Everything looks so fresh and flavorful. Definitely want to try some Hawaiian cuisine. Thanks Stephanie, hope you can visit Hawaii for some of the fresh food!